"Sound Paintings" is a collection of works exploring La Barbara's reactions to paintings and using her voice to "paint" and layer onto the multi-track tape. They are intended to be heard much in the way that one looks at a painting but, in the case of La Barbara's compositions, directed by the artist to listen to particular elements over the duration of the time-based work, i.e., “directed listening”. 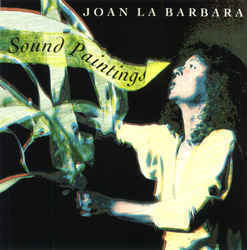 All of the vocal sounds on this CD were recorded in real time with no electronic manipulation and consist of both traditional and “extended” vocal techniques La Barbara developed over nearly a twenty year period (1970 - 1988). While the sounds are layered to create various textures, they remain natural.